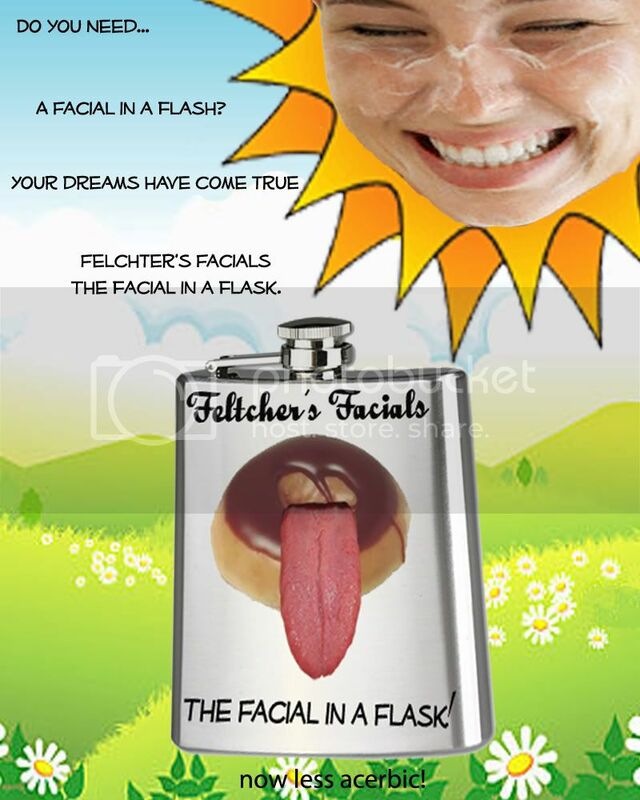 Popular Irony: The Facial in a Flask?? Get yours now!! Transcript of the July 17th 2011 re-branding meeting for customer #8472 "Lady Smooth Facial Moisturizer inc". -Hello everyone, let's get right to it hmm? Lady Smooth has been in 10th place on the lotion market for the last couple of decades. Nobody thinks of it when they think of moist face skin. We need to tear down the entire Lady Smooth marketing campaign and make something new, something hip and fresh. Something the kids will want to buy. We need to make Lady Smooth cool! - How do you suggest we do that, sir? - That is what we are here to figure out Ned! Ned, what is the very first thing you think of when you think of, the very first thing to pop into your mind, when I say...... Teenage Girls. - Yeah, lets go with that.... Kids love the beach... the beach has lots of sun... We gotta make the add Bright and Sunny!! Kids love that stuff. Ok, what else? Derick? - Um.. well umm ...I know that ...kids like sweets... I guess. - Sweets!? Yes! That's the ticket. Young people cant get enough cake and ice cream and.. Donuts!! Donuts are soft like a teeny bopper who uses our facial cream. This is good, this is good. OK, Tony what about you? Young people love...? - Rock stars Chief! Pop music. My daughter will not stop playing that trash. - Tony you are as smart as you are beautiful. Rock stars! Of course! These kids, what do they like...? They love that KISS. The kids always talk about that KISS guy's tongue don't they? We need some KISS tongue! Sharon are you writing this down? - Good because this is Gold! OK then. I have been thinking about this. We need a new type of bottle. Something that will catch the kids attention. Something that has modern appeal that will fly off the shelves. My longtime partner? Buddy? Old pal? Dearest friend? What do you think? - Put em in er flask. Thatta way dem kids can warsh it out and use for sweet juices and kool aids. - I could kiss you Horace! Brilliant! We have our ad campaign! Alright everyone just throw some flowers and some pretty lady with lotion on her face and we call it a done deal. - Sir? Are you sure we should just..
- I don't pay you to make decisions Ned, I pay you to make ideas and you have done well. Donut, KISS tongue, flask, lotion lady face, sunny with flowers BOOM! We are going to make a fortune! We just need to fix the name. Lady Smooth just doesn't cut it in the 21st century ad game. We need to make it relatable. Tony, what is the name of the creator of Lady Smooth. - Feltcher, perfect!! We can make him like Colonel Sanders! Feltcher's Face Cream? Too clunky. No... Feltchers's Skin Rejuvenator? No no no... Needs to be catchy, a bit of alliteration.. Feltcher's Facials? Yes! 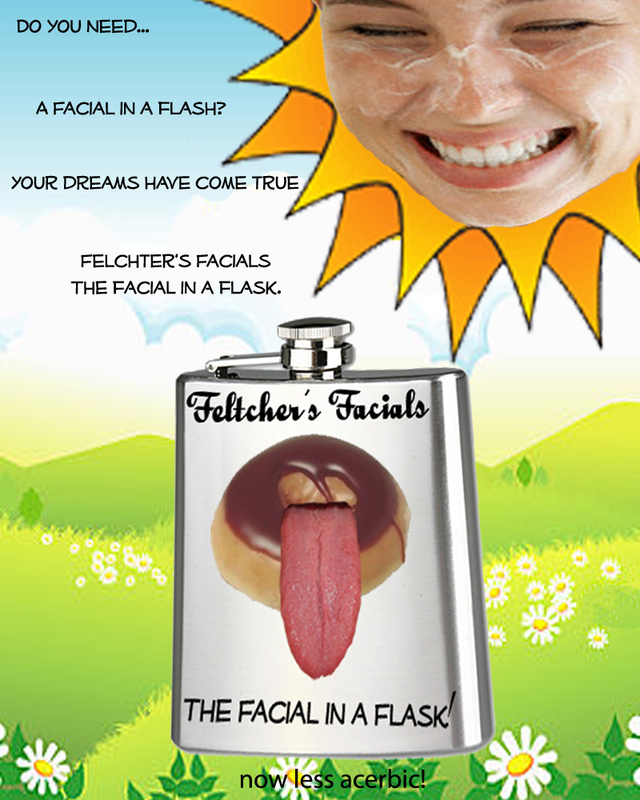 Feltcher's Facials The Facial in a Flask!! Hot Damn! We are in business! Make it happen people! I want this out on the street on every bus and billboard from here to Miami in two weeks! Meeting adjourned!